Sri Lanka could be forced to field a reserve team in their two-Test series against Bangladesh if they fail to resolve a dispute with 23 of their centrally contracted players. Sri Lanka Cricket (SLC) says the players, who include Mahela Jayawardene and Kumar Sangakkara, want a higher share of the board's revenues. The SLC is meeting with senior players to try to resolve the situation. The first Test against Bangladesh begins in Galle on 8 March. 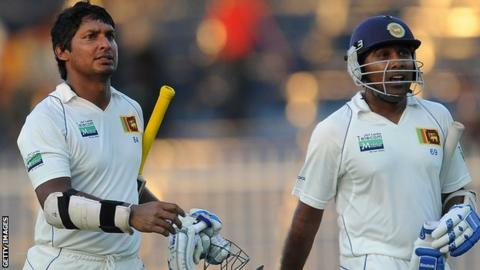 Current Test captain Angelo Mathews and Twenty20 skipper Dinesh Chandimal are also in dispute, with the SLC threatening to select a whole new team if they do not sign their new contracts. "The players are demanding 75% of the total revenue and if that is to be paid Sri Lanka Cricket will have to obtain a loan of 600 million rupees (£3.1m)," sports minister Mahindananda Aluthgamage said. A similar pay dispute threatened to derail last year's Sri Lanka Premier League after the players said they would pull out of the tournament because of unpaid salaries. In 2009, Bangladesh won two Test matches in the Caribbean after West Indies players staged a strike over pay.